I only want the best natural ingredients to fuel us! This month I'm really excited about the giveaway because it's going to get you going with so much energy in the morning you'll wonder how you ever got along without it before! Introducing Picky Oats Performance Oatmeal from our friends who make Picky Bars! You've loved the Picky Bars and now you'll fall in love all over again with Pick Oats! 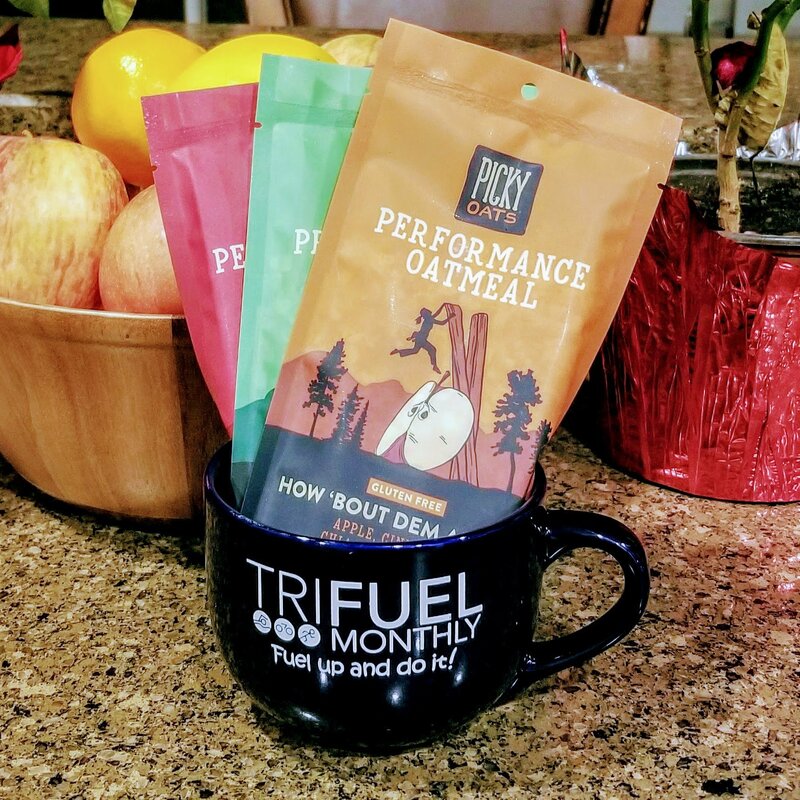 This month all of our awesome subscribers will get three packets of Picky Oats AND a great custom mug with the Tri Fuel Monthly "Fuel Up" logo on one side and the Pick Bars logo on the other. Your favorite partners on the outside and your new favorite fuel-up on the inside! Oatmeal is typically not a “pretty” food (despite its frequent presence on Instagram…) but this is NOT that beige and boring bowl of mush. Vibrant magenta thanks to organic beetroot powder with ribbons of dark chocolate goodness, this bowl of oats is close-up AND workout ready. Cacao powder gives a rich yet not overly sweet balance to the nitrate-rich beets (hello, endurance boost! ), while chia seeds and almonds give a crunch and extra antioxidant punch. A top shelf upgrade to the classic! We amped up our version of this favorite with spicy ginger and energizing chia seeds for maximum cardiovascular, skeletal, and muscular benefit. (They’re full of protein, omega 3s, and fiber, plus a host of other antioxidant and anti-inflammatory goodness.) Toss in almonds, date bits, and a little sprinkle of coconut sugar, and you’ve got a familiar yet fancified bowl of oats that’ll power you through whatever your day has in store. How bout dem apples? As you can see, Pick Oats are made of the best all-natural organic ingredients. It's the perfect way to rev your engine before a great day of triathloning. So if you haven't subscribed yet, get in on this NOW so you can enjoy Picky Oats Performance Oatmeal in your custom mug FREE! Then head out to your race and show 'em what you're made of!